A Pond Apart. Translations, localization, content for Germany and the U.S.
At home in both cultures and languages, we help Germans and Americans communicate across the pond. Professional, accurate translations from American English into German and vice versa. 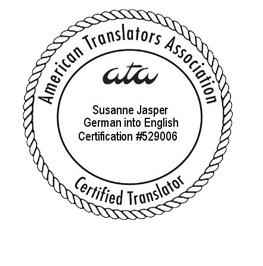 Certified by the American Translators Association. With experience in marketing and corporate communication, we create compelling texts for a variety of purposes and media. With firsthand, in-depth knowledge of the German and U.S.-American cultures and markets, we adapt your content to be appropriate and effective for the local audience. We scrutinize your text and correct any typos and mistakes in spelling, grammar, and punctuation. For an enhanced style, we also offer comprehensive editing. When translating or localizing doesn’t suffice, we go a step further and recreate the message of and ideas behind your marketing piece or campaign for your local target audience. A Pond Apart specializes in communication for the U.S. and German markets as well as in cross-cultural communication between the two. With a passion for language, firsthand knowledge of both cultures, and experience with marketing and corporate communication, we create wording that is effective and authentic from both a linguistic and cultural standpoint.